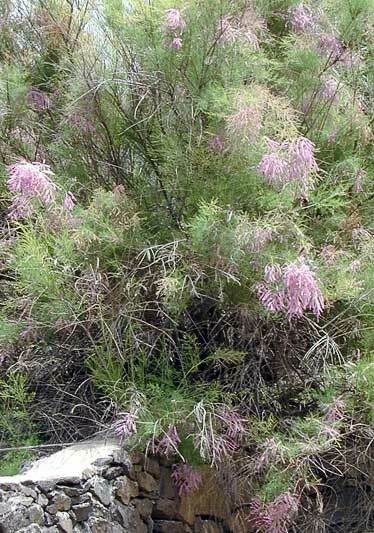 General Description: Saltcedar is a spreading shrub or small tree reaching 5 to 20 feet tall. Flower Description: Flowers are pale pink to white, small and arranged in spike like racemes. Distinct petals and sepals occur in fours or fives. Leaf Description: Leaves are small, alternate and scale-like. Stem Description: Stems have numerous branches. Fruit/Seed Description: Saltcedar forms dry capsules that contain many seeds. It is an aggressive colonizer that is able to adapt to a variety of habitats. It forms monotypic stands and secretes salt that forms a crust above and below ground that inhibits survival of other plants. It absorbs an enormous amount of water.